Events - Redland City Bands Inc.Redland City Bands Inc.
Redland City Bands present an enjoyable evening of entertainment featuring all three Concert bands – Concert Band, Wind Ensemble and Beginner Concert Band and the two Jazz bands – Big Band and Jazz Improvisation with their best music selections from the year. 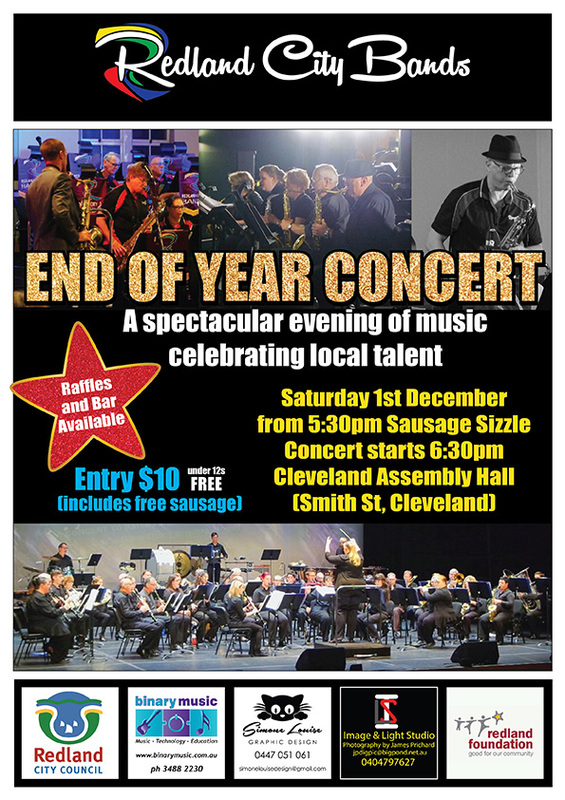 Join us on Saturday 1st December 2018 at 6.30pm in the Cleveland Assembly Hall, Smith Street Cleveland (Redland Showgrounds). There is plenty of seating and the venue is fully accessible for prams, wheelchairs and alike. A Sausage Sizzle starts at 5.30pm with one complimentary sausage per person and with entertainment by the Jazz Improvisation Group. Admission is only $10, Children under 12 free, with light refreshments provided. There will be a generous array of raffle prizes to be won and a bar available so you can enjoy a nice wine or beer or soft drink while listening to great music. This Concert is one not to be missed and is suitable for the entire family from young children to grandparents.